The Environmental Archaeology Program is pleased to count among its number several affiliate researchers whose work provides important contributions to our research program. Jenna Battillo is a Research Associate with Anthropology & Sociology at Williams College​ whose research is focused on reconstructing subsistence practices and ancient environments using pollen and other biological remains from archaeological sites. Her dissertation research, conducted at Southern Methodist University, applied optimal foraging models to paleofecal data in order to assess the motivations of Basketmaker peoples to adopt and intensify farming in southeast Utah. Currently she is working with several other members of the EAP on integrating the fish specimens donated by Andreas Paloumpis into the museum’s comparative collections and conducting pollen analysis on soils from Olmec and Maya sites. Jenna will also be working with Julie Waters and her team integrating information on paleofeces into the “Scoop on Poop” Exhibit at the Florida Museum of Natural History, opening in late January. 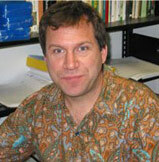 See Dr. Battillo’s new publication on the role of corn fungus in Basketmaker II diet here. 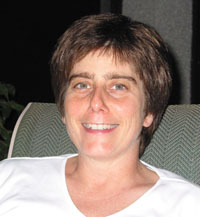 Susan deFrance is an Associate Professor in the Anthropology Department at the University of Florida. She is continuing work she began as a graduate student specializing in zooarchaeology in the Environmental Archaeology Program. This work involves extensive research on faunal samples from sites excavated on various West Indian islands, including her Masters paper on the animal remains excavated from an early ceramic age site on the north coast of Puerto Rico. Subsequently she did a study of the animal remains associated with Spanish wineries situated along the Moquegua Valley in Peru. She is continuing her research on early coastal Peruvian sites. She contributed along with several other authors to a 1998 paper entitled Early maritime economy and El Niño events at Quebrada Tacahuay, Peru, published in the journal Science (Volume 281, pages 1833-1835). Michelle LeFebvre is an anthropological and environmental archaeologist with a focus in zooarchaeology, working in collaboration with the Caribbean Archaeology and Environmental Archaeology Programs as a Courtesy Research Scientist. Her research draws on a combination of traditional zooarchaeological analysis, chemical and genetic analyses of bone, as well as patterns of past settlement and site configurations to better understand the myriad ways past people interacted with animal populations and the environment. Her primary geographic and temporal foci include the pre-Columbian Ceramic Age of the Caribbean islands and the Woodland period in the Southeastern United States. She is currently a post-doctoral researcher with the ERC-Synergy Project NEXUS 1492, directed by Corinne Hofman at the Faculty of Archaeology, University of Leiden, The Netherlands. Her research addresses how indigenous groups of the later Caribbean Ceramic Age (AD 500-European Contact ca. 1500) incorporated and used animals within multi-scalar networks of interaction and variable forms of social complexity. 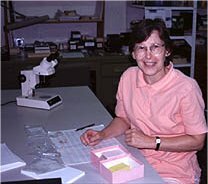 Elizabeth J. Reitz received her PhD in 1979 from the University of Florida and is Professor of Anthropology at the University of Georgia, where she manages the zooarchaeology comparative collection and research laboratory in the Georgia Museum of Natural History. She has served as an officer, board member, or committee member for the Society for Historical Archaeology, the Society for American Archaeology, The International Council of Archaeozoology, the Southeastern Archaeological Conference, and the Society of Ethnobiology. Her research focuses on the interpretation of vertebrate remains from coastal archaeological sites dating from the Late Pleistocene into the twentieth century throughout the Americas. 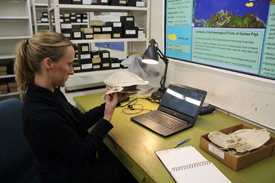 She studies collections from Peru, Ecuador, the Caribbean, and the southeastern United States. She has authored or co-authored over 100 books and articles on topics ranging from climate change to symbolism in the archaeofaunal record. 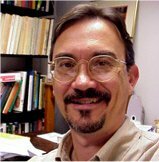 Recent publications include Zooarchaeology (2008) with Elizabeth S. Wing, Mission and Pueblo of Santa Catalina de Guale, St. Catherines Island, Georgia (2010) with Barnet Pavao-Zuckerman, D. C. Weinand, G. A. Duncan, and D. H. Thomas, and Environmental Archaeology (2012) with Myra Shackley. 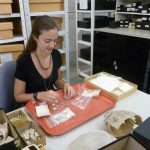 Ashley Sharpe is a Research Archaeologist at the Smithsonian Tropical Research Institute Center for Tropical Paleoecology and Archaeology who specializes in Central American fauna. In addition to analyzing bones and shells from archaeological sites, she also uses isotope analysis (δ13C, δ15N, δ18O, 87Sr/86Sr, and 206,207,208Pb/204Pb) to understand the life histories of animals, including interpreting their local environments, detecting if and how they were managed in captivity, and identifying whether and where animals were traded by humans. Her dissertation at the University of Florida (“A Zooarchaeological Perspective on the Formation of Maya States”) examined the animal remains from several Maya sites, including Ceibal, San Bartolo, Xultun, and Holmul in Guatemala and Cerros in Belize. She found recurring patterns at all sites spanning several millennia, attesting to widespread cultural practices regarding the use of certain species. 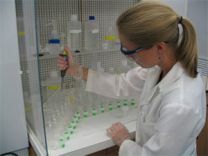 Since her Ph.D. in 2016, she has worked as a staff scientist at the Smithsonian Tropical Research Institute in Panama, where she has both continued her research examining ancient animal-related activities in the Maya area in conjunction with FLMNH-EA researchers as well as begun initial investigations to detect early Panamanian archaeological sites to understand ancient human societies and environments in the Isthmus. 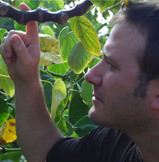 Erin Kennedy Thornton is an environmental archaeologist working primarily in the Maya cultural region. Specializing in both zooarchaeology and isotope analysis, her research investigates the acquisition, management and exchange of animal resources, as well as environmental questions regarding the interrelationship between humans, land-cover, wildlife populations and climate. Her recent work combines zooarchaeological and biomolecular analyses (stable isotopes and DNA) to investigate how animal resources, as subsistence, ritual and prestige goods, were incorporated into ancient Maya economic and exchange systems. She received her BA in Anthropology from Carleton College (Northfield, MN), and an MA and PhD (2011) from the University of Florida. Over the last 10 years, she has conducted archaeological field research in Peru, Belize and Guatemala, and lab research involving zooarchaeological collections from Mesoamerica, the Caribbean and the Southeastern United States. She is currently an Assistant Professor at the Washington State University Department of Anthropology in Pullman, WA, and manages the department’s Stable Isotope Laboratory. Karen Walker is an Assistant Scientist and Collections Manager for the FLMNH’s South Florida Archaeology & Ethnography Program. As an environmental archaeologist whose research primarily focuses on coastal southwest Florida, she studies the relationships between the Calusa people and their environmental contexts through time. Her 1992 dissertation aimed to understand such relationships at a regional scale (Charlotte Harbor/Pine Island Sound). It was based on the excavation and analysis of zooarchaeological samples from five sites–Cash Mound, Big Mound Key, Useppa Island, Josslyn Island, and Buck Key–collections all curated in the EAP. Since, she has applied that understanding largely to a single place, the Pineland Site Complex on Pine Island. A result of many Pineland excavations, along with the analyses and curation work of many colleagues (including EAP’s Scudder, Quitmyer, Ruhl), students, and volunteers is the (2013) volume edited by Marquardt and Walker, entitled The Archaeology of Pineland: A Coastal Southwest Florida Site Complex, A.D. 50 – 1710. A great portion of the Pineland collections (zooarchaeological, archaeobotanical, pedoarchaeological) are curated in the EAP.